For skin types – super sensitive and reactive. It can be tough finding products that work with your skin when it is super sensitive or reactive. So use this set to try all my products specifically formulated for skin like yours. Try the whole range… before committing to full size products. A nice way to become familiar with the range. The serum was especially lovely. Really appreciated this kit being available as I prefer to try a product line with a sampler set like this before I commit to larger sizes. The card that was included explaining the different products and when/how to use is a valuable addition. Enjoyed using all the products in this kit and my skin was a happy from the very first application. Especially love that this product is organic, Canadian, small batch, handmade. Will use and recommend! Thank you Helena! I’m glad I took the opportunity to try Helenas products. My sister Linda Smart introduced them to me. It’s simple and my skin feels clean and nourished. I’ll continue to replenish and or try the mature skin kit! I recently purchased the healing and repairing skincare kit. I have tried so many so called natural products which did not deliver what they promise. I was really glad to try the sample sizes which lasted longer than the 2-3 weeks mention in the kit. There were instruction sheets to explain all products and how to use them. I bought this healing and repairing kit a couple months ago. I loved it! I think it is a great way to try all the products to see if your skin reacts well. Mine reacted very well to all the products. My skin has been looking very healthy and has a great glow. It didn’t clear all my acne, still break out from time to time, but overall, it has been the best reaction I have had to a product without any harsh chemicals. My skin also feels better, doesn’t feel tight and stripped of everything after cleansing. I went and bought the face routine in full size. and now I use these containers for travelling. They are the perfect size. I received this sample set for Christmas and I am really enjoying it! My skin can be quite sensitive to trying new products but I had no transition period with any of the samples. I love that they have very few ingredients and come in limited and waste free packaging. I am looking forward to trying the nourishing set once I am finished with this one. Thank you for making some amazing products! I can’t say enough good things about this product and company! I received this set for Christmas we had a couple issues with shipping (non to do with this company just pure shipping problems) but they sent me a new set right away with no problems or hassle! I have also been struggling with breakouts since I moved. I have been trying everything! Even very expensive high end products! Nothing was working for me and some of the products just seemed to make it worse. This products has made me love my skin again! its not 100% but it is already so much better then it was! My skin didn’t even have an initial reaction to the products, they went straight to calming my skin right down. That’s so great, Alex. I am so happy! 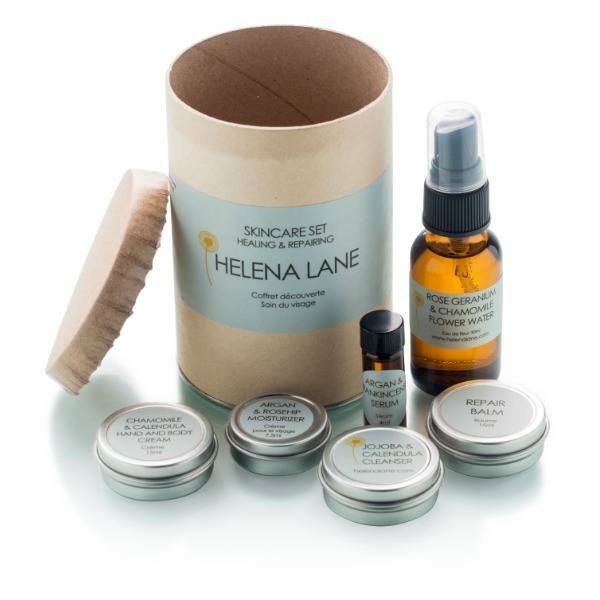 I can not say enough regarding Helena’s products. Not only are they amazing, for me personally, they have upped the level of love and experience I’ve always had for a face cleansing ritual. Somehow I feel excited every morning and evening to do my “routine”. Highly highly recommend her products. Good for the environment (🕺), good for your well-being and great for your skin! …I also have her sunscreen and am in love with it. Bravo Helena Lane, bravo. I have used Helena Lane for some time now and I will use it as long as I possibly can. The products are great, the customer service is great. I started of trying a product for my face that didn’t mesh well and was disappointed, I emailed Helena and she suggested the sensitive skin kit and I’ve been hooked ever since. I have this 5 stars even though I had a product I didn’t like and it’s all because of the service, everyone has different skin types and she worked with me to find what was best I also have 5 stars because it is excellent quality product. Love, love, love it!! So pleased we found you the products you love! I got this as I suffer from Rosacea and this was recommended. it was great to try it before committing to full-size products. I used this and have purchased all the full-size products since and my skin is noticeably clearer and no longer is painful! Full instructions are included in each set. For individual product instructions see their product pages.